Have you ever come across a quote and thought, “Yes, that is exactly how I feel!” When I first read this famous quote from Mr. Emerson, my initial reaction was instant recognition. The validity of truth expressed in these eighteen words shone brightly in my mind and stayed with me, causing me to look at situations from a different perspective. A simple question of logic spurred by this quote has redirected my thoughts and energy. If what lies within me is greater than anything that can happen to me, then why do I spend so much time on the external and not the internal? The answer to that question, dear reader, is the purpose of this blog and my many musings on different subjects. It is so much more comfortable to focus on what someone else is doing, rather than inspect my own motives or behavior. My finger, pointed in accusation towards another, still leaves four fingers pointed at me. Perhaps it is the condemnation and judgment that is so disturbing. As long as I focus on someone else, the laser beam of criticism cannot be trained on me. Fear of exposure propels my energies outward, my words shaped in judgment and my thoughts constantly on the lookout for the next victim. 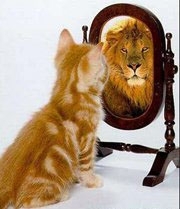 Fortunately, as I have grown older (and perhaps a bit wiser), I have learned that I have nothing to fear about myself. Time spent getting to know ME is time well spent, for it shapes my thoughts about my world. I have pulled back the curtain and discovered that I am O.K. What lies within is nothing short of God‘s greatness, waiting to be expressed without. Your thoughts are so totally in line with mine, as I find most often when reading your blog. Why is it that we so easily forget our own goodness? I find that I’m just as critical and judgmental of “myself” …perhaps even more so ..than I am of others. Even when my lips are silent, my own inner chatter continues to “stomp its feet” to distract me. It’s interesting that very often we think of “sin” as an offense against others, when perhaps denying the goodness, and beauty, and value of our own self-worth ….THE gift God has given us ..is the crux of the problem. After growing up being taught that thinking good thoughts about myself was egotistical, prideful, reason for “going to confession young lady! !” – it’s hard to make that turn to a new perspective. It’s true we’re full of both light AND darkness – the paradox of being human – but perhaps that’s the challenge …finding that balance where we can love the goodness of God within – and “accept” the darkness as only valid tool for genuine transformation. We make it difficult on ourselves, don’t we? It is so simple to say, “God loves you, now go and love others.” Much harder to actually live every moment that way. But when we keep trying and hopefully inspire others to keep trying, it lifts everyone up. Cheers to your journey of self-discovery!